250L black water tank new in 2013 and installed in the stern swim plateform which has been renovated with flexitech surface. Hull epoxy twin pack painted in December 2013 after purchased. all windows have been replaced by Smelne, using new aluminium frames and thermicline 4/9/6 double glazed windows. aft master cabin, with a walk around berth (150x2m) with a good headroom of 1.92/1.94m, lots of cupboards, storage and a hatch directly to the swim plate form as an escape hatch or ventilation. Stern thruster under the double berth and plenty storage. next is the shower room and heads and basin, also accessible from the saloon. forward to the galley area, with a sink, micro, 130L fridge, 3 gas burner. heating: diesel webasto blown air unit. stern: outside shower (hot and cold) plus a tap next to the helm with river water (pumped) for deck wash.
Live aboard dutch steel cruiser for sale in France. 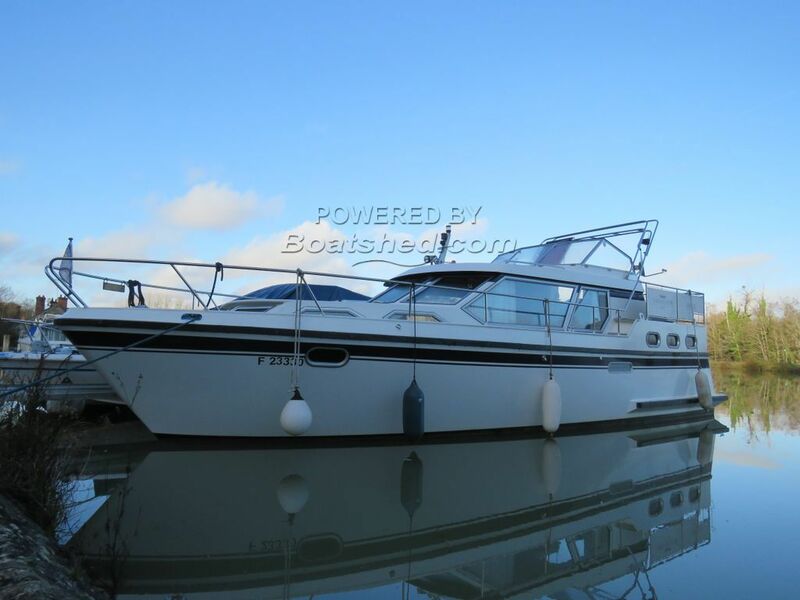 Boatshed Bourgogne is pleased to offer this SMELNE 11.60 AMBASSADOR Class, motor cruiser for sale. Built in 1996 In the Netherlands and brought from the Smelne yard by our vendor the second owner. The vessel has cruised through Europe from the Netherlands and enjoyed all the coastal, river and canals cruises on board to arrive in the north of Burgundy where she is lying now. Sadly for sale for health reasons, our owner still looks after her personally and will be delighted to see someone who could take over and enjoy as much as he has done. The interior is neat, and all the windows with special aluminium frame and double glazed make a big difference to year round use. I was impressed by the bright and comfortable interior & there is lots of storage everywhere, this is a quality cruiser built by a renowned yard. Moored in a quiet marina, closed to Paris but surrounded by nature and famous Loire vineyards the mooring could be transferred upon request. This bright spacious boat will be ideal for a family with a long cruising program or a couple with occasional guests who want to enjoy cruising the coasts & inland waterways. Please note that the chair in the saloon, all the cockery and all the decorative items are not include in the sale. For more information or to organise a visit, please contact Graham, your local broker at Boatshed Bourgogne. This Dutch Steel Motor Cruiser SMELNE 1160 Ambassador has been personally photographed and viewed by Magali WHARMBY of Boatshed Bourgogne. Click here for contact details.